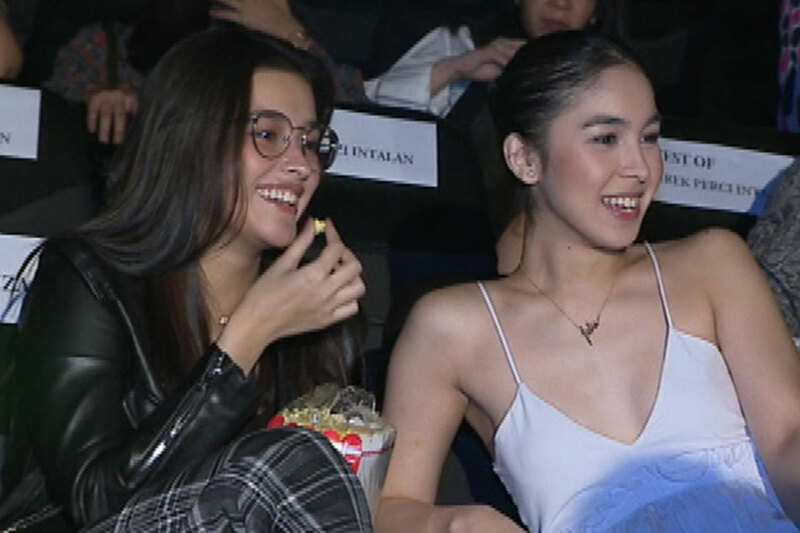 MANILA - Liza Soberano and Julia Barretto, considered among the most beautiful faces and in-demand stars in local showbiz, are also good friends in real life. The two leading ladies were spotted having a movie date on Monday night at a mall in Ortigas. They watched the premiere screening of "My Fairy Tail Love Story," which stars another close friend of theirs, Janella Salvador. "Janella asked us personally to come here and support her," Soberano told ABS-CBN News' Mario Dumaual on the sidelines of the premiere night. "She's a very good friend of ours, so of course we would go all the way out for her." Barretto added: "This is our way of showing our support for her, and we're very excited for her. Maraming pangarap si Janella. We're happy natupad 'to." Soberano, Barretto, and Salvador were all part of the same batch of Star Magic artists launched in 2013, along with the likes of Jane Oineza, Khalil Ramos, and Michelle Vito. Directed by Perci Intalan, "My Fairy Tail Love Story" also stars Elmo Magalona and Kiko Estrada as Salvador's onscreen love interests. It hits cinemas nationwide on Valentine's Day.